A spring required a force of 1.oN to compress it 0.1m.How much work is required to stretch the spring to 0.4 m? A 3.0 kg cart moving to the right with a speed of 1 m/s has a head-on collision with a 5.0 kg cart that is initially moving to the left with a speed of 2 m/s. After the collision, the 3.0 kg cart is moving to the left with a speed of 1 m/s. What is the final velocity of the 5.0 kg cart? A projectile is launched with 200 kg* m/s of momentum and 1000J of kinetic energy. 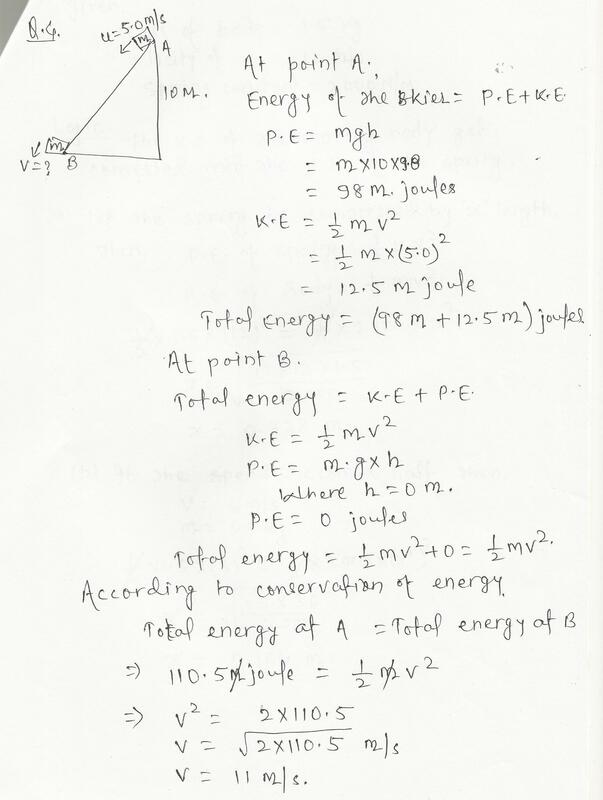 What is the mass of the projectile? A man is using a human powered mower to cut grass. The mower is pushed with a force of 45 N directed at an angle of 41% below the horizontal direction. What is the work done in pushing the mower 9.1 m across the yard? A 3250-kg aircraft takes 12.5 min to achieve its cruising altitude of 10.0 km and cruising speed of 850 km/h. 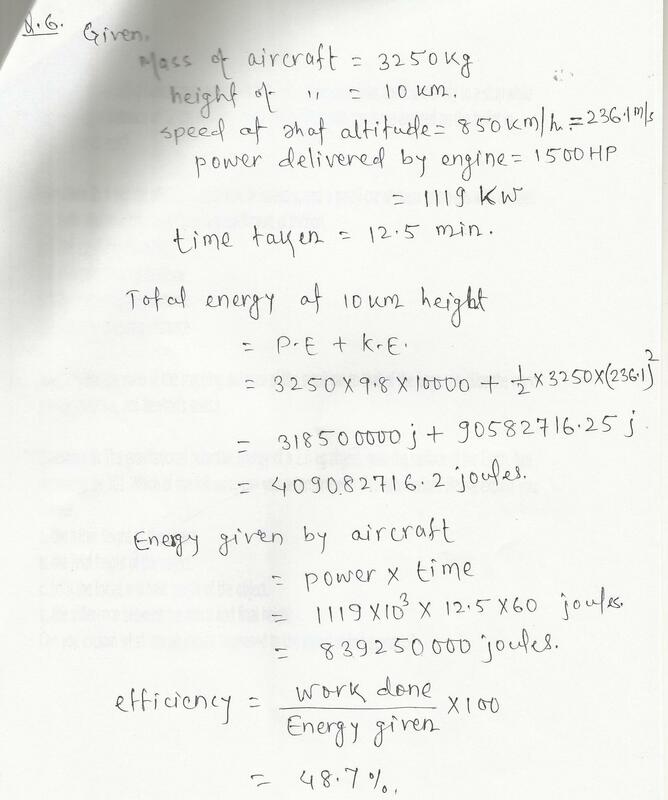 If the plane,s engines deliver,1500 hp of power during this time, what is the efficiency of the engines (neglecting air resistance)? A 1.5-kg box that is sliding on a frictionless surface with a speed of 12 m/s approaches a horizontal spring. 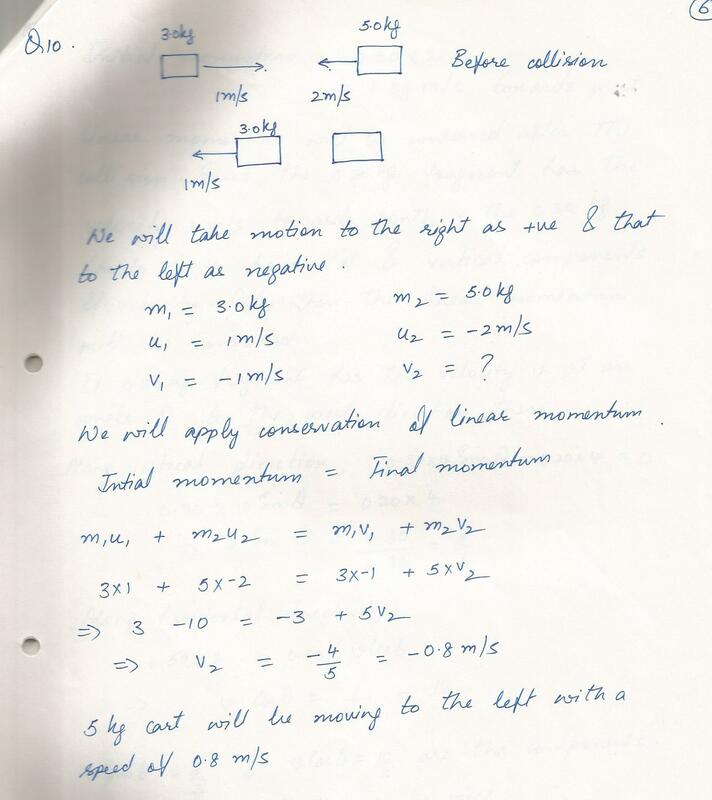 The spring has a spring constant of 2000 N/m, (a) How far will the spring be compressed in stopping the box? 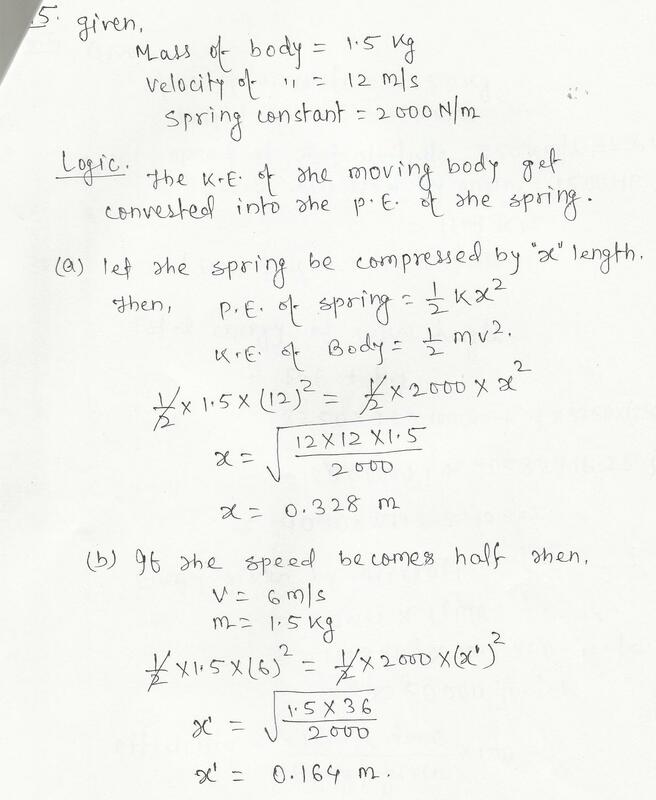 (b) How far will the spring be compressed when the box,s speed is reduced to half of its initial speed? A skier coasts down a very smooth, 10-m- high stope. If the speed of the skier on the top of the slope is 5.0 m/s, what is his speed at the bottom of the slope? 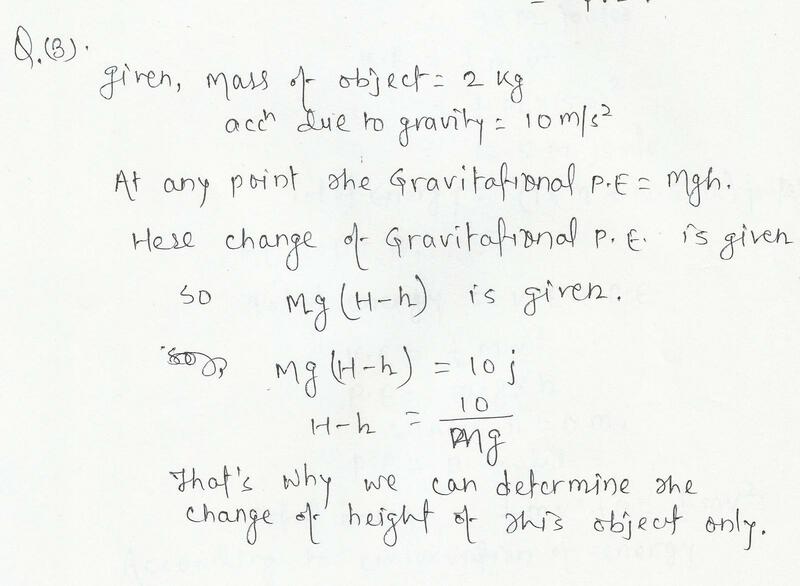 The gravitational potential energy of a 2.0 kg object, near the surface of the Earth, has decreased by 10J, Which of the following can you determine with this information?please explain your answer. a.the initial height of the object. b.the final height of the object. c.both the initial and final height of the object. d.the difference between the initial and final height Can you explain what has physically happened to the object in this scenario? 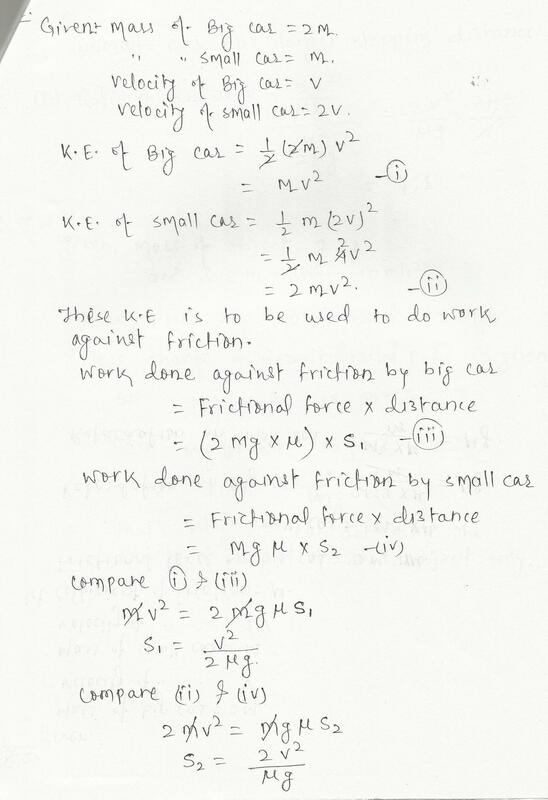 A big car of mass 2 m travels at speed v, and a small car of mass m travels with a speed 2 v, Both skid to a stop with the same coefficient of friction. Find the kinetic energy of 75-kg car that traveled 800 m in 50 seconds. 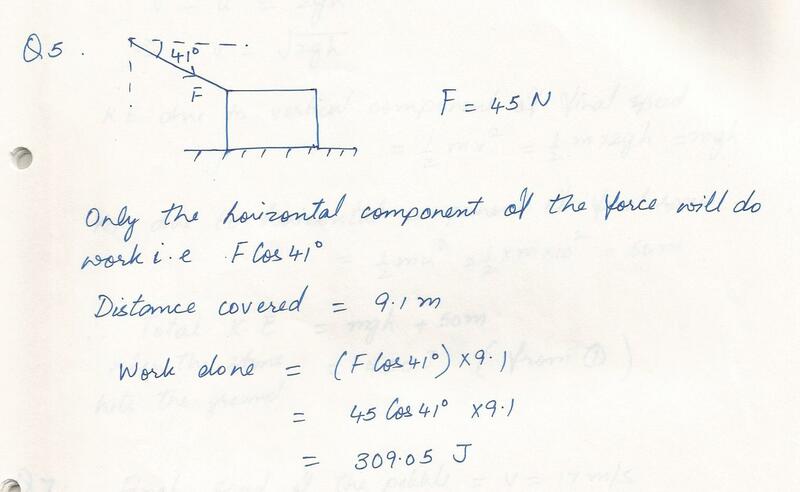 How much work is required to stretch a spring 25.2 cm if its force constant is 12.3 N/m? A 3.0-kg mass is dropped from the edge of a 50-m tall building with an initial speed of zero. The mass strikes the ground with a downward velocity of 25 m/s.How much work is done on the mass by air resistance between the point where it is dropped and the point where it strikes the ground? a.the sum of the works of the two forces is zero. b. the work of the conservative force is equal to the work of the nonconservative force. c. the work of the conservative force is zero. d.the work of the nonconservative force zero. A spring (k=600 N/m) is placed in a vertical position with its lower end supported by a horizontal surface. The upper end is depressed 20 cm, and a 4.0-kg block is placed on the depressed spring. The system is then released from rest. How far above the point of release will the block rise? Displaying 31-45 of 599 results.